When Davey and I started dating, my M.O. for attracting and wooing gentleman (aside from my ample rump, naturally) was always the same. Make them dinner. And the menu for that first meal never varied… seared salmon, couscous with diced tomatoes and feta, roasted asparagus. Many a gentleman (okay, two) had been impressed by my culinary ways. But this this Maine-bred cat entered the picture, and on our third date just leisurely whipped up some wontons that melted in my mouth, and subsequently, melted my heart. Out the door went my salmon plan. I had use to use my personality and natural charm this time. Uh oh. So, I blew his mind with my rap-along to Sir Mix-A-Lot’s “Baby God Back,” and here we are now. Happily wed, baby on the way, and he continues to whip up masterpieces, while I continue to over-enthusiastically lend my vocal stylings to inappropriate songs. And I also make quesadillas. They are not particularly impressive. In fact, they are very, very simple to make, take precisely 20 minutes, and are extremely el cheapo, as we say when we are making quesadillas. They’re also perfectly hearty for nearly-fall nights that I convince myself can be described as “chilly” (they cannot). Brown ground beef and add taco seasoning according to envelope suggestions (the envelope recommends adding 3/4 c. of water, which I did, and I was pleased with the result). Add cayenne or ancho chile powder, if using. Heat large skillet or cast iron and butter or grease pan. Place 1 tortilla in pan. In “lower” half of tortilla add a spoonful of beef, generous handful of grated cheese and desired portion of diced tomatoes. Fold tortilla in half. Allow to brown on bottom before flipping. While quesadilla cooks, quickly chop romaine and set aside. In a small bowl combine 1/2 envelope of guacamole seasoning, lime juice and large spoonfuls of sour cream and mix thoroughly. 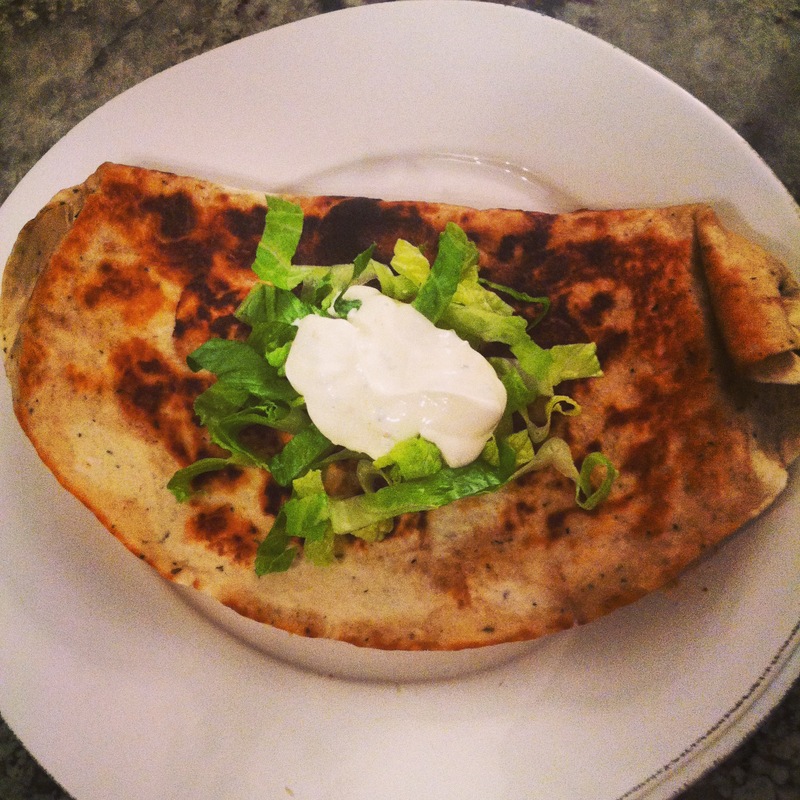 Slide quesadilla on large plate and top with handful of chopped romaine, dollop of sour cream mixture and salsa.